I would like to make everything bigger. Fonts, panels, menus, buttons, text boxes, title bars, etc. Is this possible? If not, that would mean that the size of, say, an OK button in Leafpad is specified as a certain number of physical pixels, right? If it is possible, should this be an X server setting or an Xfce one? If it is X, can you suggest something anyway, or point me at the right forum? I don't know if this is the right approach but I have tried "xrandr --dpi 120 -s 1366x768" but this does not do anything (including no output in the terminal). Doing "xrandr -s 1024x768" (ie without using "--dpi 120") does successfully do something. Help! Surely there is a solution. Xfce is unusable without the ability to "zoom" the whole desktop. I am running Xubuntu 12.10 in a Windows 7 VirtualBox with a 1366x768 13-inch screen. How about Settings Manager -> Appearance -> Fonts Tab -> DPI setting? No, this just changes the font size. Actually, if the text in, say, a button happens to too big to fit into the button, the button expands so that it fits. But this is very different from the scaling the whole UI. No, it does not scale the window. Do you not notice the small checkboxes, icons, and otherwise badly proportioned layout in your screenshot? The text gets bigger, and as a side effect the buttons get bigger. But even this is only if you make the font so big that it would otherwise not fit in the button. And if you make the font smaller, the button (height) does not change. For a font DPI setting, this is exactly what I expect. No, it is not possible to set the DPI and hence scale everything up or down. I'm guessing it is the same for Xfce. Hope this helps anyone who comes looking. There should be a way to scale everything up as retina displays become more prominent, though. I've been wondering how this is going to work in the near future, when higher resolutions are more and more common place, like 4K or that crazy 8K from Sharp. I think that the *freedesktop* people needs to come up with an standard first (if there isn't one already), before Desktop Environments start implementing anything. Something similar to how Android manages vastly disparate screen sizes and pixel densities, or something similar. My icons on applications are far too small: for example, the window closing x on firefox is often missed and i have to make 3 or 4 frustrating attempts to close them because the mouse pointer misses them. Application bars and icons are similarly too small. I can understand devs are perhaps attempting to save screen real estate for important stuff like a webpage or graphics, but but I'd like my icons to be a bit bigger than they are. Task Bar icons are fine for size; I've no quarrel with them. I'm no geek or developer so don't ask me to develop anything; beyond my realm. Double size would be just fine for me; why are they so tiny?! Go into Settings->Emerald Theme Manager, select the theme you're using and edit it. You can make the title bar bigger, if you need, and adjust the size of the buttons on it. I haven't played around with it, so I don't know if the changes take effect right away, or if you have to log out and back in to have everything change, but you should be able to see the difference inside Emerald before you exit. Currently no Linux desktop works with very high resolutions, though Gnome 3.12 which will come out in a couple of weeks will have some support. Forget about DPI scaling in Xfce though. I've been wondering how this is going to work in the near future, when higher resolutions are more and more common place, like 4K or that crazy 8K from Sharp. Well, 4 years later -- and still zero effective support for high DPI -- and you have your answer: Desktop Linux is dying, and XFCE is already dead. 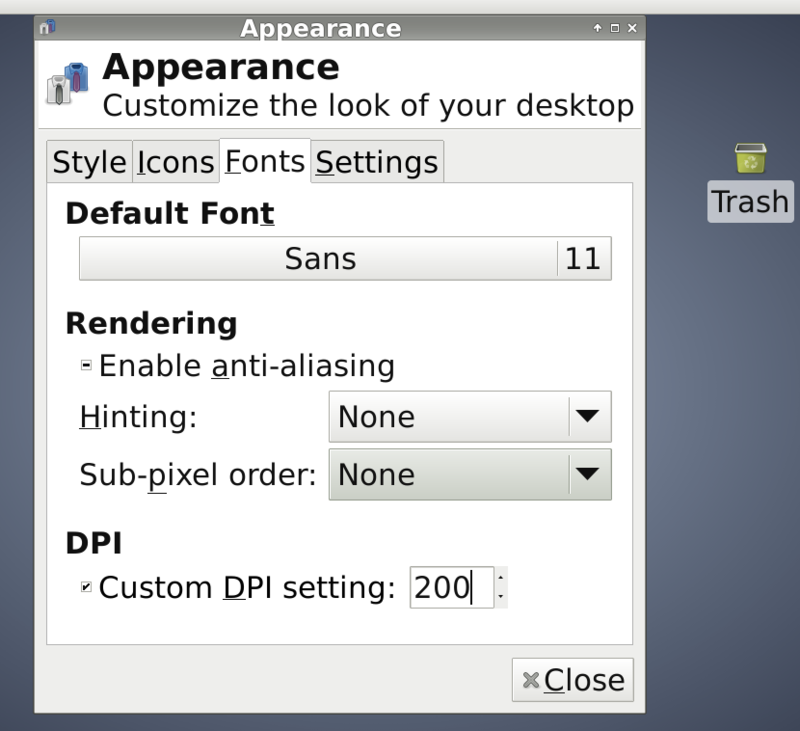 bullsh*t, both Qt5 and GTK3 fully support hdpi - so hidpi is already available on MATE, KDE, LXQt, Budgie, Deepin, GNOME, Enlightenment and Cinnamon etc. The only desktop that still has issues here is Xfce due its dependency on GTK2 - however the only component thats still missing GTK3-support is thunar and that filemanager is an unstable piece of **** so you could use Caja, nemo, dolphin and many others instead. As sixsixfive has noted, the GTK2 apps (thunar in the image) does not scale. All the other items seem to scale well and the touch screen works fine. I'm using the xhdpi xfwm4 theme and the greybird gtk2/3 appearance theme. The thunar migration is about 50% done and xfwm4 migration has begun. When they are complete, hidpi support should be much better. The current status of the GTK3 migration can be found here. To see the state of ongoing Xfce development work, you can always have a look at the git source tree. xfconf-query -c xsettings -p /Gtk/IconSizes -s "gtk-menu=32,32:gtk-small-toolbar=48,48:gtk-large-toolbar=48,48:gtk-dnd=96,96:gtk-button=48,48:gtk-dialog=96,96:gtk-panel=48,48:panel-applications-menu=48,48:panel-tasklist-menu=64,64:panel-menu=48,48:panel-directory-menu=48,48:panel-launcher-menu=48,48:panel-window-menu=48,48:panel-menu-bar=48,48:ev-icon-size-annot-window=32,32:webkit-media-button-size=48,48"